I’m glad I had the opportunity to “find a man” when I was in my early 20s. I’m glad I fell in love in my youth. I’m glad I fell in love when I was younger because I was not as conscious of all of the things I wanted and needed. All I knew is that this guy is a cool dude. He likes hanging out, having a drink or two, or four and walking in the rain. He was about to graduate with an accounting degree and wanted to work on a cruise ship. I thought that was brave. I mean who finishes undergrad and then aspires to work on a cruise ship? I didn’t have the list that so many of my friends over 25, 35, 45 seem to currently have. I didn’t even have the list that has accumulated after two decades of marriage. I wasn’t thinking about if he saved money or if he had a 401k. He made about 27k at first, and he spent most of his money. I wasn’t consciously thinking about how or if he would love our future kids. We eventually had two daughters; he avidly watches superhero films with one and advises the other about the importance of self-respect. I wasn’t worried about if he would clean the house or take my car to the shop. He ended up being obsessive about cleaning, at first, and he rarely serviced any of my cars. I wasn’t concerned about if he’d support my future goals. He does. Always. He played tennis and I barely ran across the street even if I saw a car coming. He only ate rice for lunch and dinner, while I devoured several servings of any and everything in front of him. One of our first dates was to Red Lobster. Because he didn’t have enough money, he let me eat what I wanted while he ate salad and cheddar biscuits. I didn’t condemn him for not having money, cause he was 23. Plus, I didn’t have any money either. I didn’t follow a 90-day rule. I didn’t care if he believed in God, was a Christian or an atheist. Our philosophies about a higher power developed and intertwined like violet Wisteria on a white trellis. Most days we would just be. We would talk about hypothetical situations and what-ifs grew to be realities. I didn’t read a bunch of magazines (or blogs) about how to get a man, how to keep a man, how to stop your man from cheating. I’m glad I fell in love in my youth because I had the time and space to follow my intuition and my heart each step of the way. Image. ©2013 K E Garland. All Rights Reserved. And that’s what I’ve been doing for the past 22 years of our marriage. What a beautiful love story. I wholeheartedly believe that while marriage takes work, love itself should be easy and natural. Totally agree Brittany! Sometimes, just like everything else, we try to hard and never quite receive what we want. I enjoyed this, so beautiful! I’m in my thirties and never married before. I’m glad to see that true exists and you found it early in life. Thanks for sharing this with us. Thanks Pam! The main thing is I wasn’t looking for it. Sometimes that’s the key to happiness; just live life and things come. You’re welcome. And, yes, you’re right. This is very beautiful. Happy belated anniversary to you both. Is that a thing? Maybe? I met my fiancé in middle school but we didn’t court until after high school. It’s so interesting how things start off and eventually grows and develops. lol yes! I’m accepting all belated anniversary wishes ❤ This is so true! I cannot imagine knowing my husband since middle school! Hope it was a great one. Lol good to know it’s a thing (the belated part that is). Happy Anniversary! What a beautiful tribute to your husband, and your marriage. Sometimes following our hearts is exactly the right thing to do. 🙂 Amazing Post! Very self-reflecting and honest! Thanks luv! I’m so glad you enjoyed it. What a lovely tribute to your marriage. Food for thought. You are fortunate that you both found one of the rarest things on this earth. True love. Thanks Nancy! The longer we are married, the more I agree. It seems to be very hard to find, indeed. Thanks Marie. I’m going to answer thoroughly soon, but I wanted to be sure to wish you a HAPPY BIRTHDAY! There’s so much to respond to. I’ll say this: I suspect it’s all a dream, even the reality parts, but maybe that’s something I should discuss for another post altogether. I hope I haven’t said too much Kathy and overwhelmed you. 🙂 Your posts are always so thought-provoking and engender much discussion. I do think we (single women) tend to over-analyze things. In many respects, marriage is a faith walk. Absolutely. I think that’s the perfect description. It’s like faith in action. Lists are hilarious to me. I can’t tell you how many people I’ve met who don’t possess any of the items or traits on the list that they are requiring somebody else to meet. You need to be/have/do everything you ask of others. Once people realize that they start shortening the list! LOL!!!! This is crazy, because I didn’t get notification of this response either–now I’m SMH. That list thing is just too funny! I’ll be looking out for your kwote! You’re welcome and thank you for stopping by and reading! Well, that is a beautiful written tribute to your anniversary of two decades. OMG, I love this post! Although I plan to go back and read what your other readers have to say, I wanted to comment before reading so I wouldn’t be influenced. I met my current husband of 21 years when I was a young, single mom of two boys. What hooked me was how kind he was to my sons. Even my ex-husband approved! It’s been such a tough and rocky road. There are days when I want to throw in the towel. But the blessing of being with someone from the time you are young (and we were in our early to mid 20s) is this: You have grown and evolved with each other. You have children together. You remember how the other looked so awesome in a bikini or bathing suit before childbirth and age began to take its toll (shallow sounding I know, but when I look at home now, balding, pouch belly, I still see him back then). You remember. That is always what it’s about. You remember. And you love each other for the memories. Thanks Kim! I do agree and tell Dwight all the time that we literally “grew up together” lol It’s a strange thing to think and that really is amazing that someone can know you for so long, through shifts and changes and still look at you at the core and say, “I love you.” That’s the wonderful part, and as you say, “you remember.” Yep. That’s it. Awesome story. I think however it happens winds up being for the best. I’ve never been married, and I think that was for the best despite raising 3 children. I have more clarity now than ever before and I’m more aligned with the marriage I want – more than I’ve ever been. It’s good to appreciate the unfolding, no matter what it is because ultimately we will all have a perfect one. Thanks luv! I totally agree. And I guess that’s what I was aiming for. We should all just let go sometimes and let life be the way they are (to a certain extent). Whatever has happened is always for our highest good, married or not. So agreed! Wishing you many more years with your soul mate. Can we all “love” this instead of just hitting the “like” button? As much as I love reading the NYT wedding announcements, I also love reading about people who have long, lovely relationships and marriages. A beautiful affirmation of love! Congrats! Ha! Lovely and humorous! Congrats again! Lovely post, Kathy and congratulations on your anniversary. A beautiful tribute to you both, so different in many ways but these differences has only deepened your love and respect for each other. Beautiful. Our wisteria is now budding- we have violet and white. I’m being completely literal here- no hidden meaning about the state of my relationship, although on second thought, maybe there is? In my 20s I was too busy meeting the wrong people ha ha. Yes! I’ll definitely read that!!! Uncut and uncensored – the real KG!! This is awesomely blissful! Extremely well knit piece and incredible informative too! Thumbs up and happy anniversary! Thanks for the read and comment Vincent! And thanks for the cheers. I love this! Happy Anniversary you two! 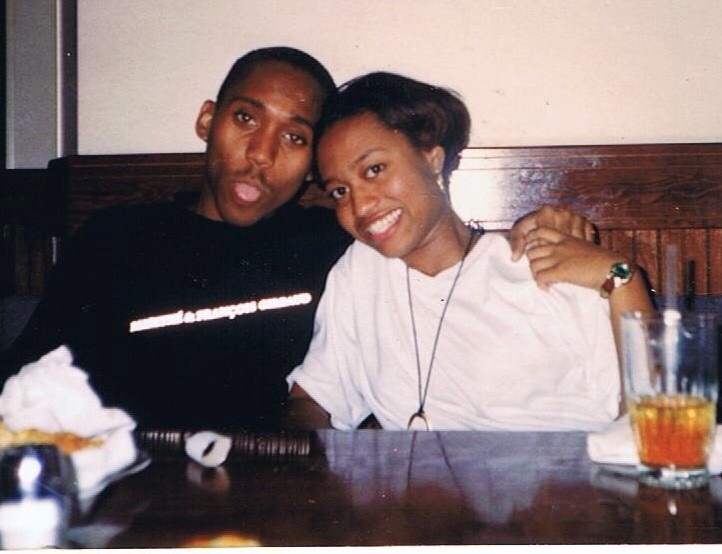 I met my husband in my 20s too, but it took us 7 years to actually decide to get married. It’s funny how when you start adulthood together the expectations are different. Like you, I have a husband that picks up the house and leaves car repairs to me. Stealing a page from your book, I loved your quote “Our philosophies about a higher power developed and intertwined like violet Wisteria on a white trellis.” Just beautiful! Thanks Johanna. Yeah I’ve watched a few friends and it’s like that list just keeps growing and growing and depending on the situation and age, the lost then has to be deleted line by line. Just curious…why 7 years? Do you know a Justin Garland.